While growing up, most of us can agree that it was always a trend to collect something. When I was in elementary school, it was a big deal to bring in anything that everyone collected. During lunchtime or free time, that was the moment to lay out everything and show off your collection. Back when I was in elementary school, collecting Webkinz was a huge deal. Once peers started collecting them it was an unending cycle. I remember seeing stacks of different kinds of animal dolls on the lunch table instead of school food. Personally, Webkinz was very unfamiliar, but I knew that the kids at my school were crazy about them. It was not until my closest friend officially introduced me to what they were and that was when my interest in the plush toys grew. For the first time ever, as a kid, I desired to collect something. When I popped the question to my mother, “Could I have one?” it soon lead me to a collection of eighteen Webkinz dolls. They are severely addicting. Once you purchase one, you automatically want more. They are super likable, playful, pleasing to the eyes due to their outward appearance. Webkinz back then came in two different sizes. One was smaller than the other which differed on the pricing as well. There were a variety of animals and as a witness, the variety grew tremendously. Unlike when I started collecting them, now there are rare Webkinz which is pretty crazy. Webkinz are collectible plush animals that carry a secret code with them. With each purchase, children are able to adopt and name their pet(s) through webkinz.com. It was originally created on April 29th, 2005 by a Canadian toy company “Ganz.” People can purchase them in stores that carry them or online (i.e, Amazon and eBay). Now let’s take a look at what type of a world Webkinz World really is. Webkinz.com is a website people can virtually play on while taking care of their purchased toys. The specialty of Webkinz is to be accessible online through “Webkinz World.” In this technical world, the users can interact with their pets by playing games, putting them to sleep, dressing them up, stop by the vet, and feeding them. It is just like having a real pet, doing everything with them in real life, but just online! It is interesting to see webkinz.com grab the concept of users adopting a pet and giving them the responsibilities as if it was real. When webkinz.com came to life, it created a way for children to claim virtual responsibility that is appropriate for their age. At a young age, through this technical world, children are capable of knowing what it is like to take care of a pet. This also makes them think if they can handle responsibility. As young children mostly sit at home watching television, they are able to expand their daily activities thanks to webkinz.com. They are able to play over a hundred of games that are educational, win prizes, which gives them variety of choices so they are not limited to one thing. 1. Booger Gets An A: This is a game where Booger thinks of a number and the player decides what two numbers add up to Booger’s answer. 2. 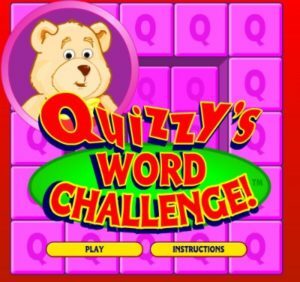 Quizzy’s Word Challenge: This game challenges you to come up with as many words as possible. Getting as many points as possible is one of the targets the user has to hit. While doing research, it was surprising to see that there is a Webkinz app that people can download onto their smartphones, iPads, and etc. It gives children access to their accounts outside when they are away from their desktops or laptops. It’s crazy how much Webkinz’s technology has changed over time. When I was young, there were a limited amount of games, a limited amount of animal choices, and no application that anyone can download. This proves that technology is growing and even for young children! From a collection of dolls to an online world, Webkinz World shares a positive platform that promotes interaction while learning how to use technology and being social. It is a friendly community that inspires young children to log on and enjoy their quality time as they are introduced to a variety of technology uses. Hi! I'm a student at Rowan University majoring in Elementary Education and Liberal Studies! I have a passion to write in my journal and online at cafes or in an environment that is quiet. I mostly enjoy writing young adult non-fiction and fiction!